This past weekend of July 11-13, we had the good fortune to visit the Tuscarora Indian Reservation and attend the annual Summer Picnic and Field Days. The Tuscarora have many ties to Pennsylvania, migrating through here from North Carolina 300 years ago on their way to a new home with the Iroquois Confederacy. They eventually settled in the Niagara Falls, NY area, but they periodically return to Pennsylvania at various times commemorating their ancestors’ migration. The festival is an annual gathering that brings families and clans together for a celebration. The opening ceremonies were in “the grove”, across from their new community center. The grove was designated for the festival about 80 years ago and now has a cement stage, food preparation and comfort facilities. The Summer Festival celebrates its 170th anniversary in 2015. The parade into the grove consisted of chiefs carrying flags and symbols of their nation, followed by the clan mothers. Neil Patterson Jr. spoke in Tuscarora giving the opening welcome and prayer. There are currently only six Tuscarora that speak the language but teaching their language has been a project that is in the forefront for the Nation. The Big Drum Ceremony called all the people together and a special presentation was made to Lee Simonson. His involvement in the December celebration of the Tuscarora Heroes Monument (http://www.TuscaroraHeroes.com) in Lewiston, NY was acknowledged with a fine plaque from the Nation. The real festivities started when the dress and dancing contests began. Children were clothed in traditional clan dress, handmade by people in their clan (such as grandmothers, mothers or even grandfathers). Beadwork is always hand sewn and frequently depicts a clan symbol (such as the turtle, bear, snipe, deer or beaver) or a significant event relating to the clan. Children are judged on their dress and show great deportment while standing in front of the audience of hundreds of people. The youngest, a one month old baby was held by his proud father. The dancing contests began with the youngest (from 4 years old on up) showcasing their renditions of traditional dance. It was impressive to see how serious the children were when it came to honoring their traditions of dress and dance. They were taught the dance steps and worked diligently to do them correctly on that hot afternoon, while fully clothed in traditional regalia. After the children showcased their dance, the adults entered serious competitions, especially in the traditional ‘Smoke Dance’. The dances represent periods of the past or the transformation of a Tuscarora child into adulthood. Dancing brings the community together and each has a symbolic meaning. The Rabbit Dance is fast and symbolizes the hunter chasing the quick and clever rabbit while the Smoke Dance symbolizes the growth of a child to a man or a woman. Community, camaraderie, food, renewing traditions and outreach are the spirit of the Tuscarora Annual Picnic. The cares of the outside world are far away and left to be dealt with another day. This week the letter “I” is devoted to our struggle for independence from British rule that occurred subsequent to the signing of the Declaration of Independence on July 4, 1776. The actions of the Continental Congress would forever change and define a continent that Europeans had only begun to colonize less than 200 years prior. Events preceding the Revolutionary War including the French and Indian War had created tensions between the colonies and the British government. Britain was struggling under the financial burdens of war and enacted a series of taxes against colonists who had already rallied together for a number of causes, each time gaining confidence and a growing sense of independence. At the dawn of the American Revolution, Pennsylvania was the third largest colony and contributed abundant supplies and labor, essential to the development of our new nation. Philadelphia was the largest city in North America with a population of nearly 30,000 residents. It served as our nation’s capital during most of the rebellion and as an important ocean port to the Delaware Bay. The city’s location was important for the shipping of supplies destined for the military. The British recognized its strategic significance and, after taking New York in October of 1776, moved quickly and decisively to capture Philadelphia. Cheval de fries undergoing conservation treatment. Attempts by Pennsylvania to halt the advance of British forces included the installation of a line of defense in the Delaware River between 1776 and August 1777. 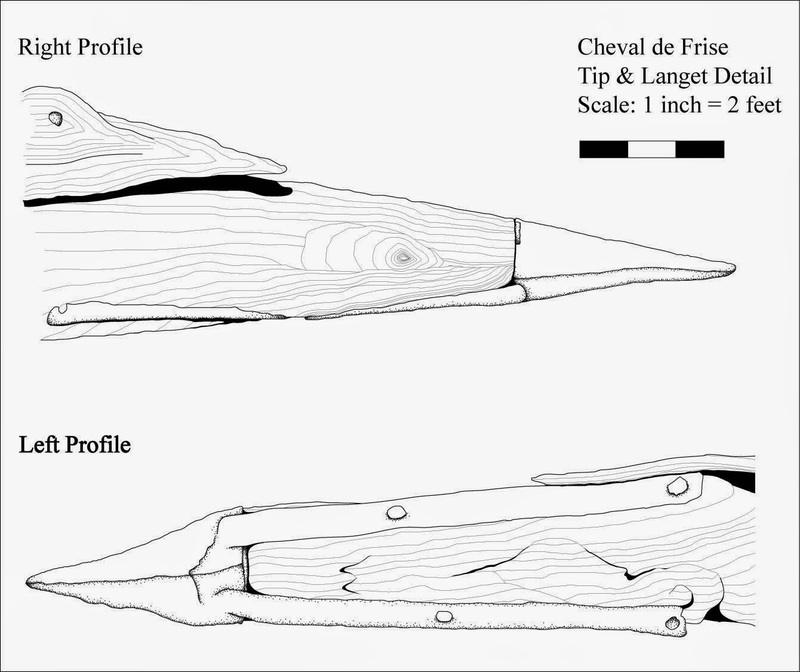 A series of chevaux de frise were sunk between Fort Mercer and Fort Mifflin. General George Washington’s successful crossing of the Delaware on December 25, 1776, buoyed the morale of patriots which aided in securing guns and supplies for American troops. The Philadelphia Campaign of 1777 by British forces resulted in Washington’s ill-fated battles at Brandywine and Germantown and forced his retreat to Valley Forge for the winter of 1777-1778. After being forced out of Philadelphia by the British, George Washington’s Continental Army spent the harsh winter of 1777-1778 at Valley Forge along the Schuylkill River, about 25 miles northwest of center-city. Although the field of Conflict (Battlefield) Archaeology has only evolved during the last twenty years or so, its new methodologies have greatly assisted the work at this site. Archaeological investigations conducted by the National Park Service for more than a half-century included large-scale excavations. More recently, technology has provided us with equipment for remote sensing, such as ground-penetrating radar along with sophisticated metal detectors to locate concentrations of artifacts, and architectural foundations of buildings and structures used by Washington’s soldiers. 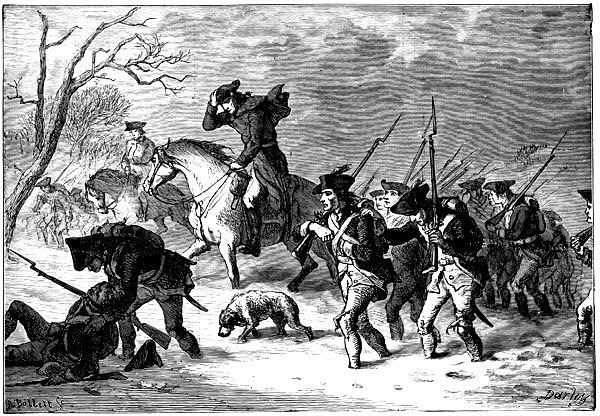 The arrival of troops to Valley Forge in December was poorly planned, supplies such as tents had been directed further west to avoid capture by British forces and food provisions were almost non-existent. Politics, weather and logistical breakdowns contributed to the hardships endured at this site. 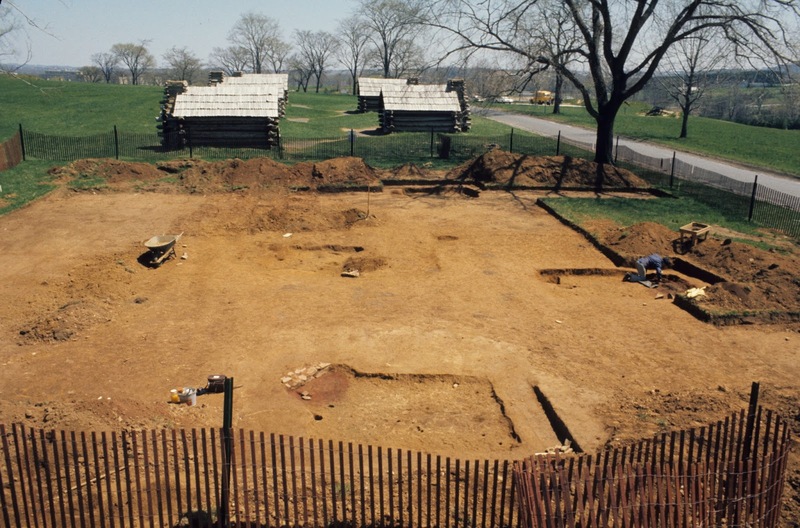 Even though Washington ordered living quarters to be neatly laid out in rows, archaeology proved that the huts were haphazardly placed in groups by battalion. Two Pennsylvania brigades from General Anthony Wayne’s division were on a rise toward the southwestern edge of the outer line of defense. The second, Conway’s Brigade was positioned towards the center of the inner line of defense. Archaeology has revealed that instead of the 14 by 16 ft. hut stipulated by Washington, some of the huts were 16 by 18 to accommodate twelve men. 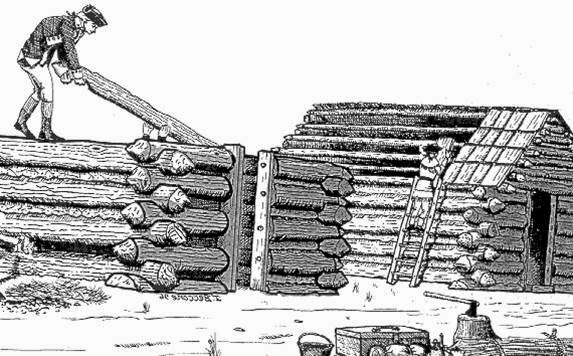 Artists rendition of hut construction at Valley Forge. 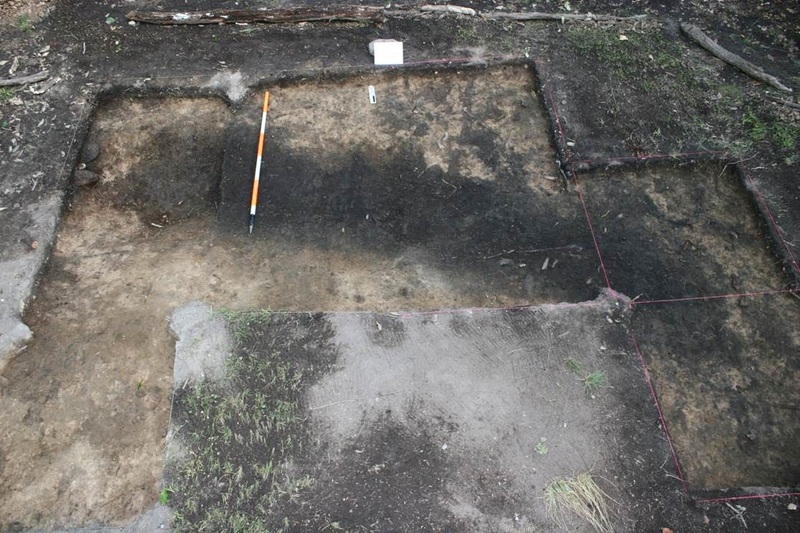 Excavations in the area of Wayne’s Woods revealed huts terraced into the hillside, fireplaces primarily constructed in stone and oriented to the east. The size of the floors varied, one structure discovered was 12 by 22 ft., and was generally oriented in rows parallel to the crest of the hill along the outer line. Trash pits yielded additional evidence of diet and activities amongst the troops. 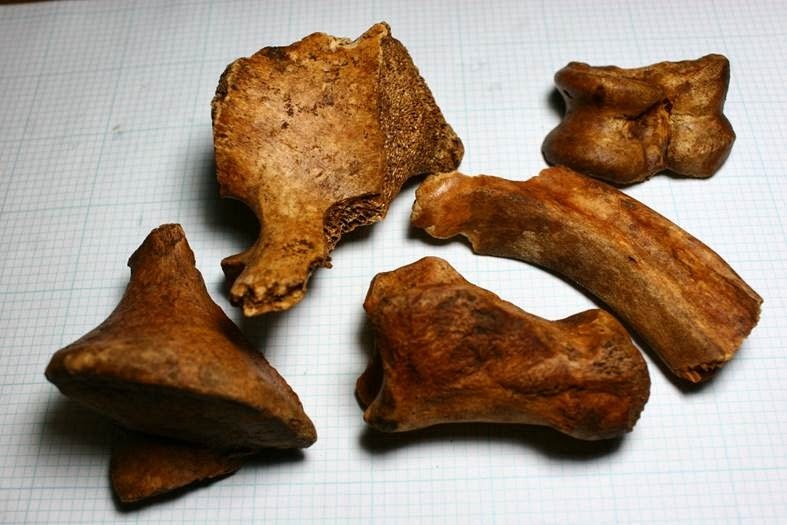 Recovered bone from refuse pits at Valley Forge provide evidence of a diet which included beef and pork. Analysis of the dietary evidence indicates the soldier’s diet included beef and pork in somewhat better conditions than historians often describe. Evidence of the camp kitchen or hearth area yielded evidence of a round raised cooking area with ports or ovens for small cook pots. Individuals could prepare stews and soups that would feed multiple people with just a small amount of meat. Excavations of the kitchen, note the dark circular stain. Artists depiction of camp kitchen. Troops endured harsh winter conditions, as well as disease and breakdowns in the supply system. In addition to the Pennsylvania forces at Valley Forge, Virginia and New Jersey troops were also present. Historic documents provide evidence of the politics associated with supplies and provisions associated with the various brigades which can be supported by the archaeological record. The shortage of clothing is well documented in the historic record and archaeology has provided some additional documentation to support this information. The sources of buttons recovered from the site indicate that soldiers were removing buttons from uniforms worn by British forces that were killed or wounded. Anthony Wayne personally contracted with a Lancaster manufacturer for coats, breeches, shoes and hats, but buttons for these garments would have to come from local sources and may have been a wide variety of forms. Bone buttons were produced in cottage industries, including the prisoner of war camp at Camp Security http://twipa.blogspot.com/2009/12/camp-security-artifacts-revisited.html and have been recovered in excavations at Valley Forge. USA Button excavated at Valley Forge. We close with an artifact that perhaps best symbolizes this desire for independence and the creation of a new nation. The recovery of pewter USA uniform buttons from these excavations is further evidence of the daily lives of these soldiers and their willingness to persevere and endure incredible hardships so that we may enjoy our freedom as an independent nation. We hope you will be inspired to learn more about the important role that Pennsylvanians played in the Revolutionary War and check your family heritage for connections to these brave soldiers. Enjoy your Independence Day celebrations and help us to preserve our past for the future! Presentation at Workshops in Archaeology, The State Museum of Pennsylvania. Revolutionary War Soldier at Valley Forge, Chapter 4. AltaMira Press, CA. Birthplace of an Army, A Study of the Valley Forge Encampment. Harrisburg; Pennsylvania Historical and Museum Commission. The Mind and Spirit of Early America; Sources in American History 1607-1789. Appleton-Century-Crofts, New York.